Today’s case is an 8-year-old female neutered terrier mix with chronic cough and respiratory distress. History of lifelong respiratory problems. What are your findings? There is an alveolar pulmonary pattern with air bronchograms in the dependent portions of the right cranial, right middle, and left cranial lung lobes. The bronchi to these lung lobes are widened and irregular, and do not taper in the periphery. There is a diffuse bronchointerstitial pattern in the caudal lung lobes. The accessory lung lobe is hyperinflated with a thin soft tissue opacity wall and no discernible internal parenchyma. In the portion of the abdomen included, the liver is enlarged. Abscess, bulla, or cyst of the accessory lung lobe, likely secondary to chronic lower airway disease. Bronchiectasis and pneumonia. 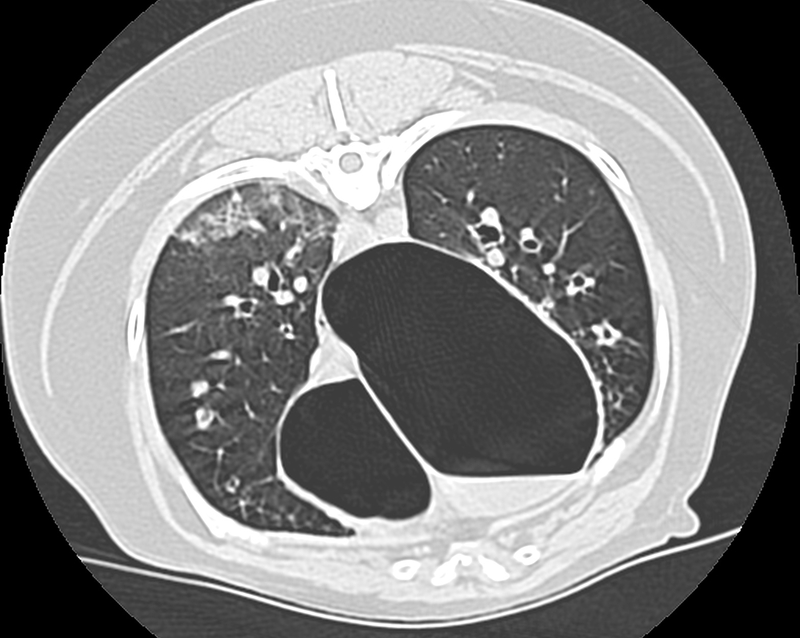 A cystic transformation of the accessory lung lobe was confirmed on CT examination. The lung lobe was removed, and histopathology showed severe bronchiectasis in the remaining tissue and large cystic cavity representing lung lobe with loss of internal structure secondary to inflammation. 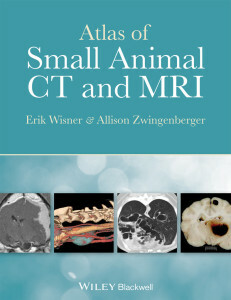 I believe an abscess or cyst should not have been given as differential diagnoses as a bulla was really the only possibility given the opacity of the affected region (air opacity and not fluid/soft tissue opacity). There is some soft tissue opacity within the cavitary lesion on the left lateral projection suggesting partial fluid filling. This along with the likelihood of an inflammatory condition given the diffuse bronchial disease makes abscess and cyst differential diagnoses. This lesion was inflammatory and contained fluid on CT examination. Ok I see your point. The radiographic findings don’t mention fluid opacity within the air filled space with no pulmonary markings but I see it was proven by CT that there was some dependant fluid within the predominantly air-filled cyst.